This deck was piloted by Russell Lindberg to second place at the North Carolina Regionals and you can find his own deck analysis here with the guys at The Destiny Council. 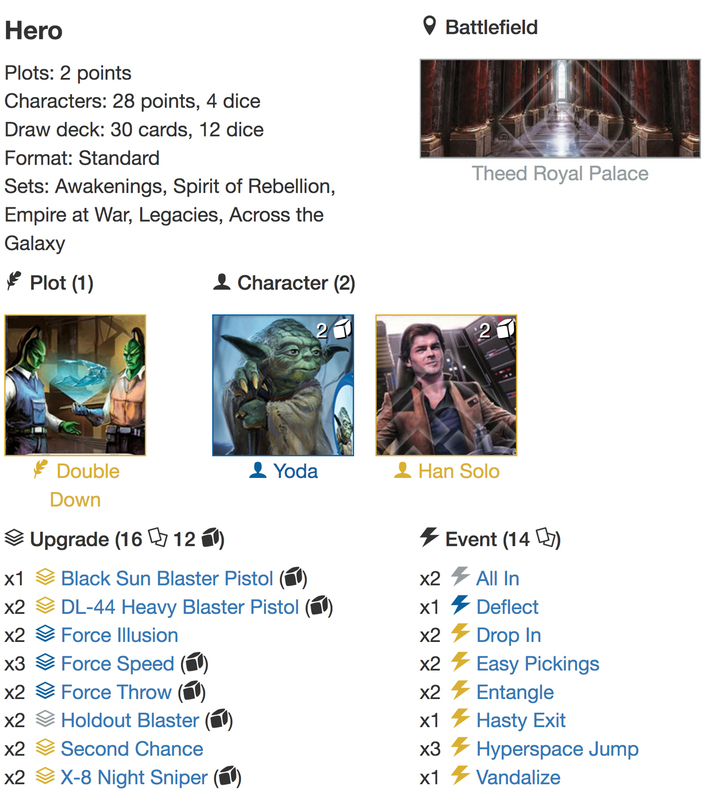 He eventually lost in the finals to Dustin Wilson's eYoda/Hired Gun/Gungan FAT Shadow Caster deck, which we previously published a deck analysis of. This deck has traits very similar to the eYoda/eLeia3 that we analysed some days ago (there's even a section which is copy/pasted straight off that analysis), and bears many similarities with the eYoda/eCassian deck that received some attention during the Way of the Force meta. 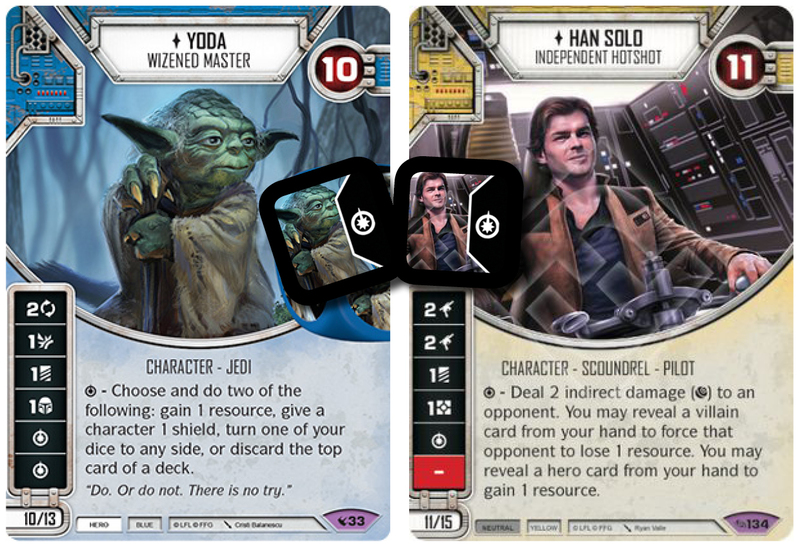 The last four hero decks we have analysed on the YOUR Destiny website have all contained YODA! It's not that we are Yoda-obsessed, but he's really just that good! Is he broken? Probably. He is extremely potent and with the nerf to Snoke stands alone at the pinnacle of support characters. Yoda is just majestic and I constantly get impressed at how he can alter the course of games all by his lonesome self. Most importantly, as a true support character, he makes any and all characters he's teaming up with better. My love for HAN SOLO3 has actually grown over the last weeks. As I get more games in with him, I've started appreciating his true potential and partnered up with Yoda he really shines. His Special side has always been his best side, but hitting it reliably is a problem ... unless you play with Yoda. When DOUBLE DOWN was first spoiled people were going crazy. We even posted an article on what cards you'd possibly want to Double Down on, and while its impact on the game has been nothing like the hype suggested, it's still good and might even become waaaay better as the card pool is about to decrease significantly with rotation upcoming. This deck goes all in on speed and Hyperspace Jump tricks! it's about resolving your dice fast, preferably bypassing mitigation and Hyperspace Jump into the next round before your opponent gets a chance to get his round started. Preferably you want a Hyperspace Jump from round 2 and every round from there on (just watch out for those Probes that can really ruin your turn). Hyperspace Jump functionally becomes mitigation in this deck, which also explains the choices concerning removal cards, and while your chance of drawing a Jump from round 2 (provided that you draw 5 cards) is 50% it's still not a watertight plan. Don't put all your eggs in one basket. When I first looked at the deck, I was honestly a bit surprised at not seeing Cunning anywhere. 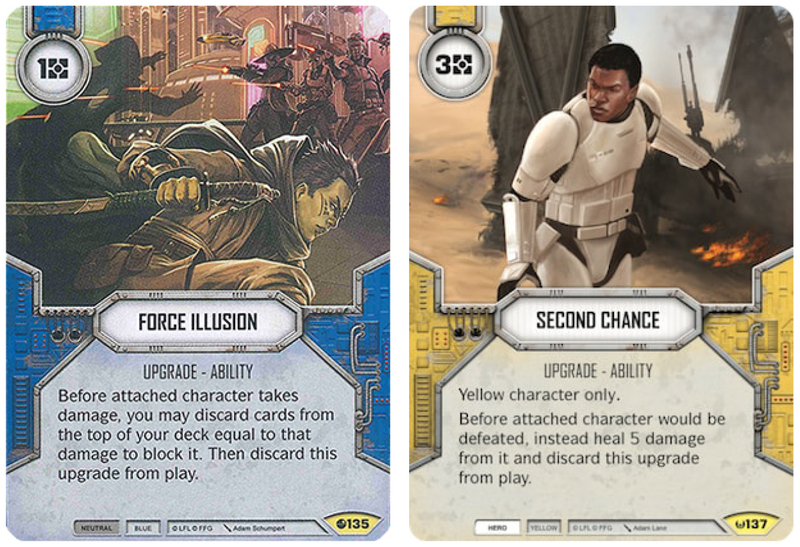 It's such a powerful upgrade and allows you to deal damage AND gain resources (resolving it as a Han Solo Special) or add to the consistency of the deck (resolving as Yoda Specials), but as I started getting more games in with the deck, I didn't really miss it. I still want to try adding it though possibly replacing one DL-44 Heavy Blaster Pistol and a Holdout Blaster. The upgrade suite in this deck follows a classic aggro-midrange template with loads of upgrades and a plan to play AT LEAST one every round, maybe even two! You have plenty of resources and are aiming to see at 2cost gun and a 3cost upgrade, Force Throw (against FAT Vehicle decks) or a DL-44 Heavy Blaster Pistol against all comers. 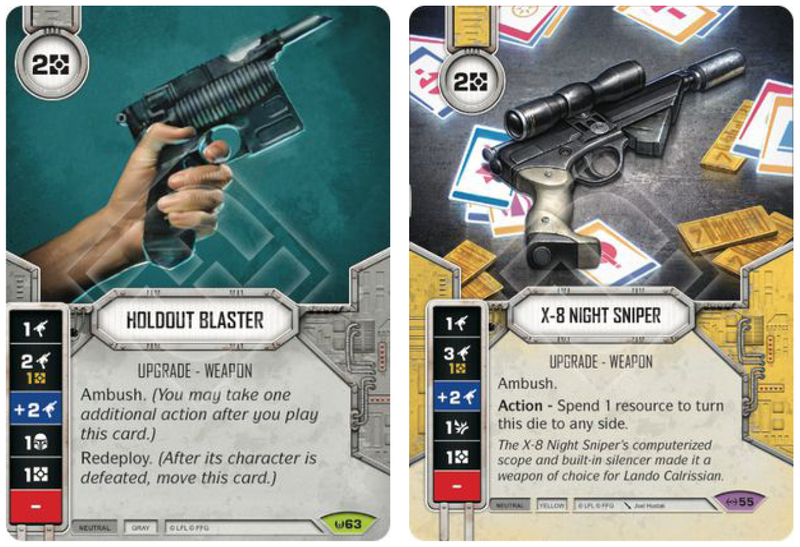 The HOLDOUT BLASTER and X-8 NIGHT SNIPER are your standard 2cost weapon, and you'll want to get one of those down as early as possible. Both guns fit well on either Han Solo or Yoda, but should preferably go on Han, especially if it's the Holdout Blaster due to Redeploy. They both have decent damage sides and a Resource side, while the ability on the X-8 Night Sniper can be absolutely murder midgame. An argument could be made for including the Hidden Blaster, but it only has 1 base Ranged damage side and while it's ability is good, you rarely get to use it round 1 because you initiative roll-off average is bad and not a lot of opponents wants to play on your battlefield. Redeploy on the Holdout is also just too good to miss out on. Both the BLACK SUN BLASTER PISTOL and the DL-44 HEAVY BLASTER PISTOL has 3 big damage sides which should be expected from a 3cost gun, and the Special on the Black Sun Gun is deceptively good if used in conjunction with Han Solo Specials. That can easily be a damage placement nightmare for your opponent. Redeploy on the Black Sun Blaster Pistol (as long as it's on Han Solo) is really good, while the ability on the DL-44 is nice pseudo mitigation. Both guns can easily be replaced by a Second Chance when needed. It's really a tech card against FAT Vehicle decks, Vader's Fist and Darth Vader decks. Being able to consistently remove a 3+ die side and deal damage to an opponent is awesome. 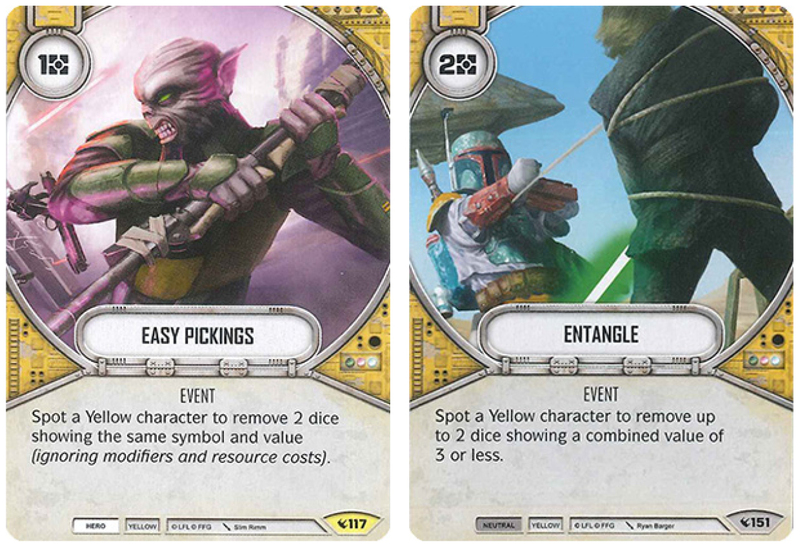 It's a HUGE weakness that it can only be played on Yoda, and in some match-ups it feels like a dead card in your hand. It's a costly investment, and it doesn't have the big inherent damage sides of your other 3cost upgrades. So knowing your opponent's deck is important here. It does force your opponent's sequencing though and since you are faster than the majority of decks you'll probably manage to get the die proactively into the pool if needed. There's unfortunately no way of cheating it into the pool, so it will be sitting like a lame duck against mitigation. Your character team boast an underwhelming 21hp ... that's pretty meager and you'll be using a lot of the Yoda Specials to gain resources (to build your boardstate, play mitigation and Hyperspace Jump, which is pretty expensive) and turn dice, so your shield generation is at a minimum. Because your deck is also playing a fast paced game and likes to have initiative proactive mitigation is incredibly powerful in this deck! FORCE ILLUSION is great! Don't let it sit in your hand for too long. As a proactive mitigation card, so it should hit the table when possible. It also often works as a great deterrent and can at times prompt your opponent to focus down another character instead. This is usually a bad decision, but often your opponent's bad decisions is also what will win you games! This card has always been ridiculous! It can be used to replace an upgrade to effectively make Han Solo a 16hp character. That's a pretty tall mountain to climb! Don't get greedy - if saving Han means replacing an upgrade which still has the die in the pool, lose the die - or risk losing Han. You run a relatively small mitigation suite: 6 cards (+2 Force Illusion and 2 Second Chance), but since you are aiming for speed and ending 1 or 2 rounds with a Hyperspace Jump, you can probably afford it. 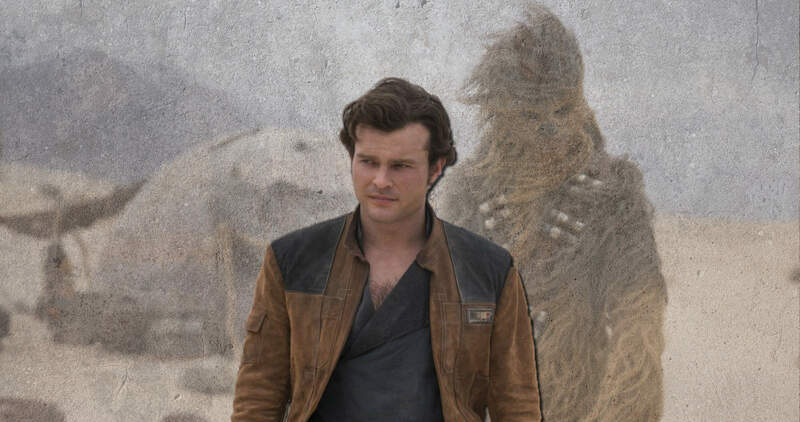 If Han Solo is defeated, your opponent controls the Battlefield and you are playing against a Melee based deck, your only available mitigation is in fact: Force Illusion. 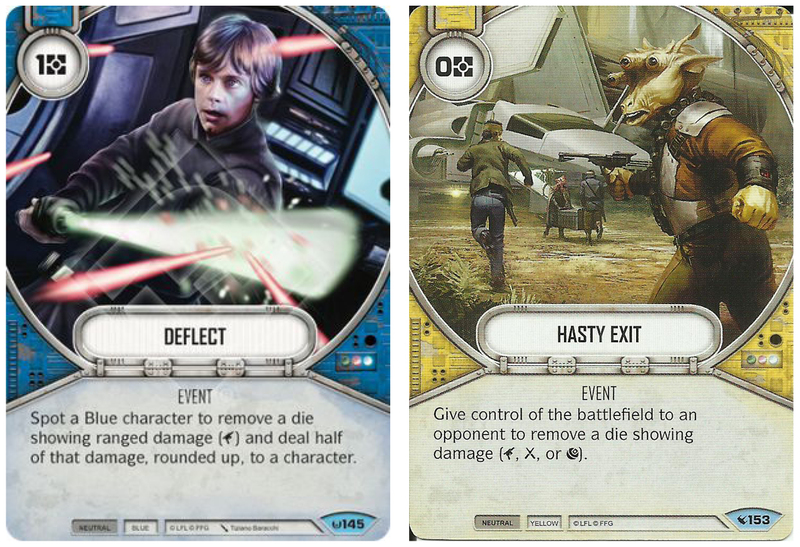 Both EASY PICKINGS and ENTANGLE are some of the best removal cards in the game, but are also Spot Yellow removal cards, and while it's a priority to keep Han alive, I think it's a liability to have so much of the mitigation being dependent on him staying in the game. I'd probably switch it around a bit to fit in at least 1 Overconfidence to replace 1 Easy Pickings. There are also a few of the prevalent decks around which are difficult to Easy Pickings, i.e. eVader3/Greedo. Ranged damage is making a comeback and DEFLECT is an excellent tech card against it. Being able to remove a Vader's Fist 3 Ranged damage and end the round with a Hyperspace Jump before it can be Power Action'ed into the pool and resolved is pretty massive. You will have control of the Battlefield against the majority of decks around, which means that Hasty Exit is a cheap and effective way of Removing damage sides. Just remember, if you are playing on Theed Royal Palace to use the Power Action BEFORE playing Hasty Exit. In a deck with so many options of turning dice sides ALL IN is really good. It allows you to swiftly resolve all your dice, make sure to play around mitigation, i.e. bypassing an opponent stalling out the mitigation until AFTER you focused your dice to Ranged damage, and set up for your Hyperspace Jumps. This is the yellow counterpart to Hit and Run, only difference is that you need to play on your Battlefield to benefit from Ambush. That can luckily be solved by switching the Battlefield the first time you Hyperspace Jump. In Russell Lindberg's own write-up he says that Vandalize was the last card to be tech'ed in, and I understand the logic behind it. You can sacrifice your entire round to get rid of an early FAT Firespray-31 or FAT Shadow Caster, not to mention Chance Cubes and whatnot ... nice tech! THEED ROYAL PALACE is an awesome Battlefield! And playing with a neutral character like Han Solo it's a total no-brainer. It's a free resource every round and you don't lose speed or an action ... it sets you up for your Hyperspace Jumps as well as allowing you to improve your boardstate while still playing mitigation! It also relieves some of the pressure on Yoda's dice to continuously perform! Only thing is that your Initiative roll-off is HORRIBLE!! Your average on Yoda's dice are 0,83/die and 1/die on Han. You'll probably not get your Battlefield without using Hyperspace Jump first. Nobody is going to give you a free resource per round without putting up a fight first! There are actually a lot of strong starting hands you can settle for in this deck! 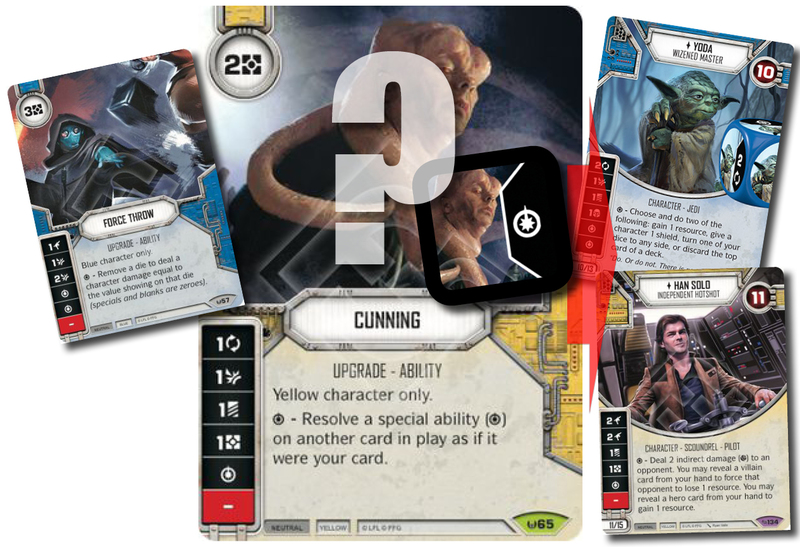 Cards you do want to see though are an early Force Speed for Yoda and a gun for Han Solo. I also like to get the Force Illusion early to take off some of the pressure of mitigating. I like to have a second blaster in my hand in case I find the money for it OR I get to start with Theed in which case you can almost immediately put two guns on Han and be off to a flying start!